Join us in the fight against childhood hunger by supporting Check-Out Power Pack during your next trip to the grocery store. 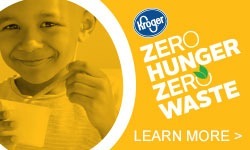 Grab a $4, $8 or $16 coupon at the register at your neighborhood Kroger and hand it to the cashier. 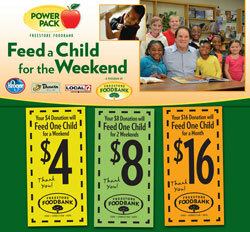 Your donation amount will support the Freestore Foodbank’s Power Pack program. 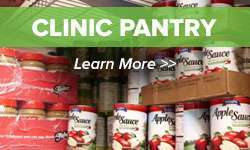 Each Friday during the school year, the Freestore Foodbank sends bags of food, known as Power Packs, home with students to ensure they have something to eat on weekends. Each Power Pack contains nearly a dozen food items, which are shelf-stable and kid-friendly. 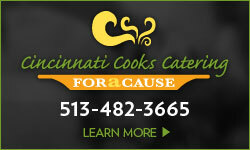 We think it’s important to provide children with food that is easy to prepare. A few examples of what you might find in a Power Pack include canned fruit, 2% milk, cereal, red beans & rice and applesauce. Over over 80,000 children living in the 20 counties served by the Freestore Foodbank are food insecure, meaning they aren’t always sure where they will get their next meal. About over 4,000 children in more than 95 participating schools receive Power Packs from the Freestore Foodbank each week. The children are primarily between the ages of six and 12 and live in Hamilton, Clermont, Clinton, Pike and Scioto Counties in Ohio and Campbell, Kenton Boone and Grant Counties in Northern Kentucky. Your donation through Check-Out Power Pack helps children receive the proper nutrition they need to help them succeed in life. $4 will help feed a child for a weekend. You can also donate to Power Pack online. Check-Out Power Pack runs through November 1.